1. What is the code for the word ‘Hindi Medium’? 2. What does ‘18I#’ stand for? 3. What is the code for the word ‘Another ’? 4. What is the code for the word ‘things’? 5. What is the code for the word ‘More’? A word arrangement machine when given an input line of words rearranges them following a particular rule in each step. The following is an illustration of input and various steps rearrangement. And Step VI is the last step of the arrangement as the desired arrangement is obtained. As per rules followed in the above steps, find out in each of the questions the appropriate step for the given input. 6. What is the position of the word 'Perfection' in the 4th step? 7. How many steps will be required to complete the arrangement? 8. Which is the sixth element to the left of the fourth element from the right end in the second last step? 9. What is the position of the word 'Nationalization' in the last step? 10. Which of the following steps will be the last but one? There are four boxes coloured i.e. Blue, Black, Red and White in which four types of cold drinks are stored. brands are Pepsi, Limca, Mirinda and Coca cola. Boxes are arranged in such a manner from top to bottom. There are two boxes between Black colour box and Red colour box. The box in which Mirindra are stored is above Red colour box, but not immediate above. The box in which Limca is stored is immediate below white colour box, but not stored in Red colour box. Pepsi box is above the Coca cola box, but not immediate above Limca box. 11. In which of the following colour box, Pepsi is stored? 12. Which of the following drinks is stored in second lowest Box? Mr. Bhargava starts his journey by car when he sees 1 green light. He keeps driving and after an hour and reaches the first signal where he sees 1 red light and 2 green lights, he drives 15 minutes after noticing them and reaches the 2nd signal at which he sees 1 red light. From the second signal to the third signal he drives for 45 minutes. On reaching the 3rd signal he notices one light is red and three lights are green, but he continues driving for another 30 minutes. He now reaches the 4th signal where he notices equal number of red and green lights. When he drives further he recalls that at the 4th signal two lights were of red colour. After driving for 30 more minutes he sees 5th signal which is the last signal in his journey as he witnesses three red lights there. 13. 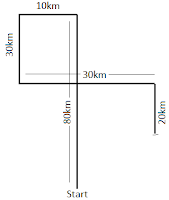 What is approximate straight distance between the second signal and the end point? 14. 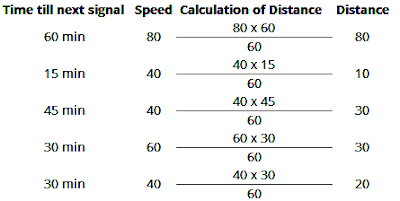 If the first signal after the starting point, is 2 Red lights and 2 Green lights, then what is the total distance covered by the man till the last signal ? 15. 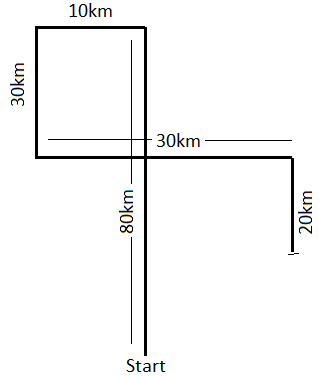 In which direction is the starting point from the end point? Following the rule, the first code of the word 'Tomorrow' would be '^'. a. If the sum obtained is an even number, the code will be obtained by dividing it by 2 and finding the respective letter in alphabet on the same position. b. If the sum obtained is an odd number, the code will be obtained by adding 1 to the sum, dividing the sum by 2 and finding the respective letter in alphabet on the same position. The word 'Tomorrow' starts with 'T' and ends with 'w'. These two letters take 20th and 23rd position in english alphabet respectively. Dividing (43 + 1 =) 44 by 2 we get 22. Now the letter at the 22nd position in alphabet is V.
So, the middle code for the word 'Tomorrow' obtained by applying the rule discussed would be V.
3. The number in each of the codes represents the position of first letter of a word in reserve alphabetical order - minus three. So the code for the word 'Tomorrow' be 7 - 3 = 4. Hence, the complete code for 'Tomorrow' will be '4V^'. Following the rules discussed so far, we can code the other words as well. In each step two changes are happening. One in the number and the other in word given. Numbers are first getting reversed and are arranged as per their highest and lowest values. Words are arranged according to the number of vowels in each word and the parity (the fact of being even or odd) of these numbers while prefering an odd numbered word prior to the even one. Step 1: The highest number obtained after the reversal of the given numbers is placed at the extreme right end and the lowest odd numbered vowel word is getting placed at the extreme left end. Step 2: The lowest number obtained after the reversal of the given numbers is placed at the extreme left end and the highest even numbered vowel word is getting placed at the extreme right end. Step 3. Now, second highest number obtained after the reversal of the given numbers is placed at the extreme right end and the second lowest odd numbered vowel word is placed at the extreme left end. Step 4. Now, second lowest number obtained after the reversal of the given numbers is placed at the extreme left end and the second highest even numbered vowel word is getting placed at the extreme right end. 14. D) Since only the direction of the man has changed, the total distance covered by Mr. bhargava will still remain the same.